If you’re like me, then you’ve no doubt wondered what would happen to zombies if they encountered that dreaded season known as winter. Would they freeze and become statues of the walking dead only to thaw come spring? Or would they continue on with their flesh-eating business with barely any frostbite? That question is answered in Dust Eaters North, but that only scratches the surface of the depth of the novel. After a zombie outbreak hits, a group of survivors trek from Oklahoma to the great white north (more specifically Churchill, Manitoba) in search of a cure. Though it’s only a small leg of their journey, along the way they pick up another survivor, Tara, whose luck was nearly out. From that point on, the horrors of survival in an undead-infested, frozen wasteland come full frontal, with each survivor fighting not only the living dead, but their own humanity. It can get really cold in Churchill. Like, really cold (-26 Celsius, or -14 Fahrenheit for you wacky Americans — and that doesn’t include the windchill), so kudos to author Ronan Cray for braving the sub-zero temperatures and actually venturing north. His real-life experiences bring an air of truthfulness to an otherwise stylized doomsday scenario. From it, he’s able to paint a bleak, desolate landscape that, with or without the walking dead, is a perfect example of the solitary that is the north Canadian wilderness. Though the Canadian part is just one tiny piece of the puzzle, to have it accurately portrayed brings an authenticity to the other locations visited in the novel. The characters are well-crafted, particularly Tara, whose many defining moments make her the underdog everyone wants to root for. Once readers come to know the varied stories of the survivors, it’s easy to understand the choices they’ve had to make along the way (some easy, some hard). That human factor, the one that’s often overlooked in the zombie genre, is a welcomed presence here, and adds a level of depth often missing in similar stories. 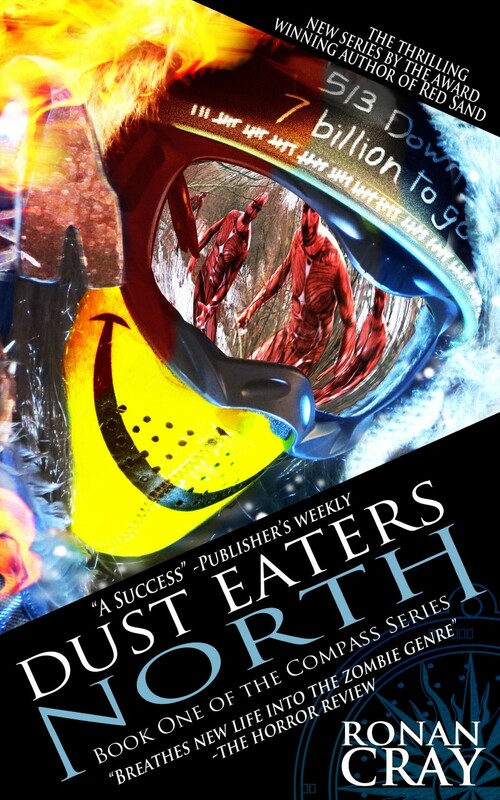 Cray breathes new life into the zombie genre with Dust Eaters North. So if you like globe-spanning adventures with realistic characters and a fast-paced plot that entertains with every turn of the page, pick this one up.